No joke: today is April 1st, which means it's time for a new magpie of the month here at The Court Jeweller! So far, we've examined jewel-wearers from the past, but this month, we're delving into the collection of a currently-reigning queen: Margrethe II of Denmark. She's the daughter of two reigning royal families , and she has a heirloom jewel collection to match that impressive legacy. Today, let's kick off the month with a look at a floral tiara for spring: Margrethe's versatile floral aigrette. The complicated, all-diamond tiara apparently dates to the middle of the nineteenth century. It’s said that it perhaps once belonged to Grand Duchess Anastasia Mikhailovna of Russia, whose elder daughter, Alexandrine, was the consort of King Christian X of Denmark. 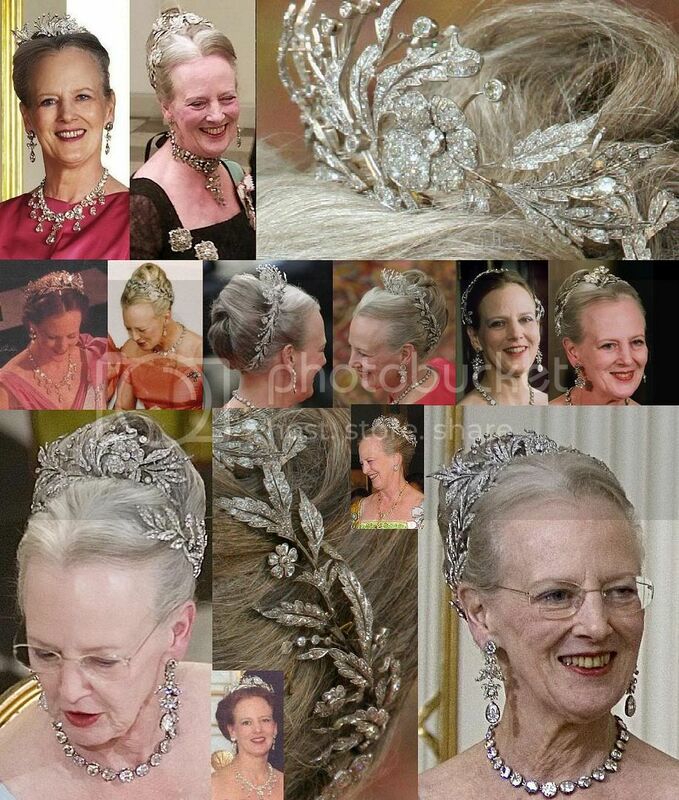 (There’s another tiara in Denmark that once belonged to Anastasia — the Queen Alexandrine Fringe .) The tiara breaks down into three sections. It’s a large piece, able to be worn as a nearly closed circlet. The various sections can be taken apart and worn separately. The central flower element of the middle section is mounted en tremblant, so it shimmers and moves slightly as the wearer moves. By the middle of the twentieth century, we know for sure that the tiara was not in royal hands. It was owned by a famous Danish-American tenor, Lauritz Melchior, who was famous for singing Wagnerian opera. His wife was photographed in the aigrette in the early 1960s. 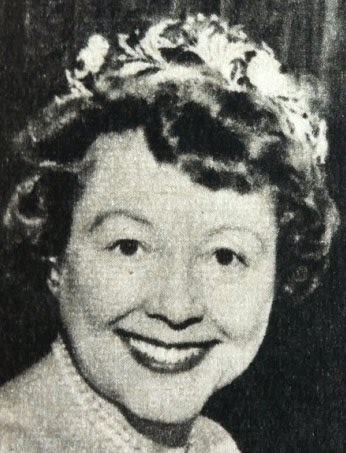 But in 1963, the Melchiors decided to part with the tiara, putting it up for auction. The buyer was King Frederik IX of Denmark, the grandson of Grand Duchess Anastasia Mikhailovna. The tiara’s connection with the grand duchess is ultimately speculation, but it would make sense for Frederik to purchase a tiara at auction if it had once belonged to one of his ancestors. After all, the Danes had plenty of sparklers at their disposal already, so I think that the links to Anastasia are highly likely and that the purchase was a sentimental one. 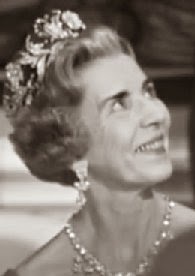 Frederik’s wife, Queen Ingrid, wore the tiara for the first time at Margrethe's wedding to Count Henri Laborde de Monpezat in 1967. She continued to wear it regularly at occasions afterward, (you can see her wearing it in the image at left), and she also lent it to her daughter. 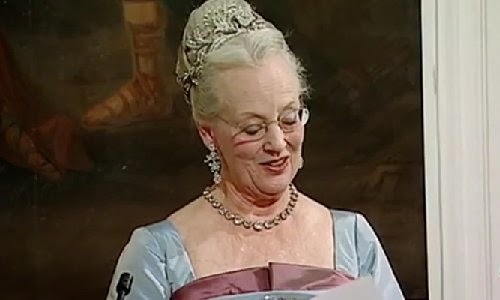 Queen Margrethe has been incredibly inventive in the ways that she wears the piece, donning parts of it as a brooch and arranging the sections in various ways in her hair  She remarked in De Kongelige Juveler, an absolutely excellent royal jewel documentary , that she enjoys the versatility of the tiara. She noted, "I like wearing it slightly differently from time to time, and I think my hairdresser enjoys doing it like that, too." 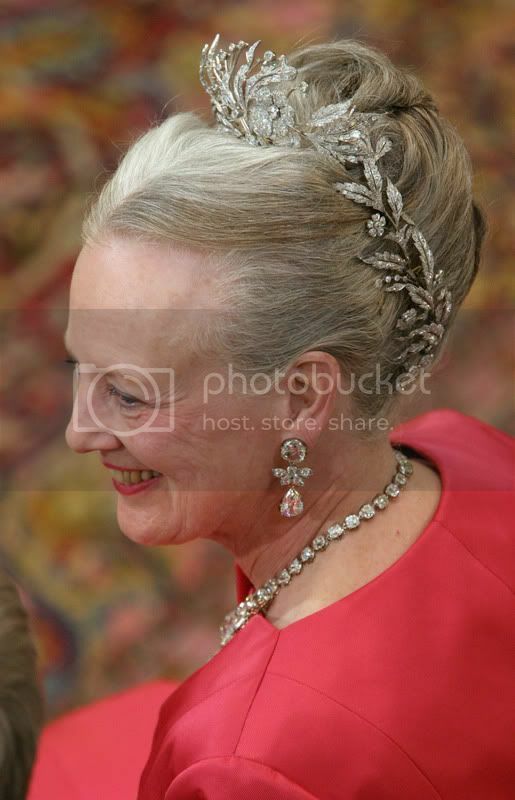 Margrethe inherited the piece from her mother in 2000, and since then, she’s continued to wear it frequently, often pairing it with an important diamond necklace from the Danish crown jewel collection. 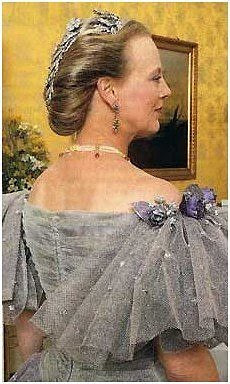 She even chose the aigrette for one of the most important Danish royal occasions of the twenty-first century: the wedding of her elder son, Crown Prince Frederik, to Mary Donaldson in 2004 . 1. Cropped still image from a YouTube video; source here. 2. Her father was King Frederik IX of Denmark; her mother, Queen Ingrid, was born a Swedish princess. 3. The Alexandrine Fringe is owned today by the Rosenborgs, descendants of Queen Margrethe's uncle, Prince Knud. 4. Cropped still image from a YouTube video; source here. 5. Here's a great collage from the Royal Jewels of the World Message Board that demonstrates the tiara's versatility. 6. As of the publication of this post, the two-part documentary can be seen on YouTube. 7. A version of this post originally appeared at A Tiara a Day in December 2013.